Paula's Dollyland: Its all change in the village!! Two houses go and one comes Back!! Its all change in the village!! Two houses go and one comes Back!! First of all apologies for leaving it so long to update my blog! I kept getting an error code which was stopping me from adding a new post, but I have finally got round to sorting it out and now I have a mountain of things to catch up on!!! About a fortnight a go I decided to have a total revamp in the village! I had fallen out of love with it as it felt too crowded and was all a bit too much! I decided to take out a couple of houses to free up a bit of space! I decided to sell Beach Cottage and Sea Shanty cottage. It wasn't a decision I took lightly as i loved them both but the problem I had was that they were both lovely houses and that's what they needed to be a house/home. With the cute back windows and fireplaces I couldn't make them work as shops which was what I was desperate for space for. Luckily within a few days a found a lovely local buyer who collected them on Saturday. It was easier to part with them knowing they were going to a good home!! So what's changed!!! Well first of all Forget me not cottage has now become the rest home. It was just done as a house before and wasn't one I really loved like Lavender or Seashell it was just a house! My favourite room was the kitchen so I have left that in place. I think it works well in here and somehow the name just seemed right! They have four rooms instead of 3 and its much more fun than it was as a house! The kitchen needs a nice jolly cook! The dining room also doubles as a recreation room with a card playing table! The lounge is where you can relax! Poor Gladys is still waiting to be collected! Next up is Barnacle cottage. I had done Sea Shanty as the holiday cottage so that's now moved back into Barnacle where it fits so well. I have done it a little different using a smaller bed so I could fit the bathroom in. 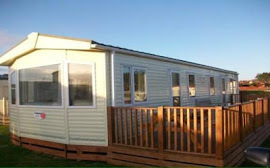 Its bijou but has all you need for a nice stay by the seaside! I have always struggled with the downstairs in this cottage! It didn't work as a shop as it's in the residential part of the village. I had a idea to move the sewing shop in as a dressmaker wouldn't necessarily need a shop just premises to work from. It works really well in here as its a nice big room! Of course Debs fab quilts steal the show but I think its much more impressive all in one room than spread over 2 like I had it before. This little pink shop was the music shop but I decided it would work better as a flower shop. The flower shop was formally in the corner shop but that's a good size and it didn't need to be in something so big. I figured if I moved it into here that freed up the corner shop for something else! The music shop has gone into the Post Office and the Post Office has moved to the little empty blue shop I had so it all worked out well! It works perfectly in here I am so pleased I moved it! Needs a few more things a row of coloured ribbons above the desk is my next job! I did have the 3 small shops here next to the beach but it was really cramped and I didn't feel like I was 'playing' with them anymore as they were awkward to access. I have now moved the pub here which is much better! It has the canopy and table and chairs at the side and is easy to get in and out of! Porthole has moved along to the end and I added a bench behind to hide the wires! By moving the pub next to the beach that meant finding a space for the 3 smaller houses. I really liked these on the windowsill before as they are not as big they let the light through and make the room feel a lot less oppressive. having the 2 big ones there is what was making the room feel so glum! They just feel like their own little street and I love them being back here! It actually fitted better than I thought and there's lots of scope to add a few more details and some doors and maybe even some funky wallpaper! By taking out 2 houses left me with a lot of space! My plan was to sell them and use the funds to buy a shop. I had a lovely big shop a while ago and had sold it to my friend Diane who lives about 45 mins away. She asked if I would like to buy it back and she would bring it over a couple of days later! It was too good an offer to resist as I know it was a lovely property it just wasn't right at the time I had it! At the time it was a bit big but now I have a few other taller houses it would fit ok. She kindly bought it over on Wednesday and I have to say it was made for the space!! It had to lose a bit of its chimney to fit under the shelf but that's fine it was very tall anyway and I have left most of it in place! Diane had painted it grey but I wanted to make it into a nursery shop and thought grey was a little dull so I decided to go with a pale green. I have it on a couple of smaller shops but not on any bigger ones. Its really suits it and I am so happy Diane let me have it back its perfect!! Its such a pretty cottage and looks amazing when its lit up. It also has really pretty wallpaper and lovely lights so I am really chuffed its back in the village! Its been so nice to spread all the nursery stuff out! I had all the lovely stuff from the nursery in Forget me Not so I have been able to rehome it all in here! I made a small mother and baby corner but will prob redo this when I get a more suitable sink come changing unit! There is still more to come!! Lobster, Wishes and Dishes and the corner shop have all changed! There is a new witchy cafe and the little vintage house is almost full! I will update more soon so as not to bore you with too much in one go ha ha!!! It has been a lot of work but I can honestly say the village feels the best it ever has at the moment! Everything feels like its the right thing in the right place and although I was really sad to see 2 go its really made me love the village again so it was the right thing to do! Wow you have been busy, but love all the new stuff! It's so hard to keep up, I dunno how you do it! O.M.Gosh you have been busy I love what has happened to the village everything looks great in it's new space. I have to say the nursery looks lovely with the cute prams and bouncers! Everything looks so good! I love all the cuteness! You have such a big collection.